A smart space-saving solution for condos, apartments, even RV's - anywhere space is limited and room for your pet is a must! 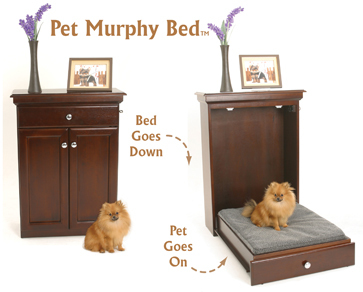 The Pet Murphy Bed is available in Black and Mahogany. The innovative Pet Murphy Bed complements your home and provides a comfy fold down bed alternative to traditional pet beds. Easily blends in with existing furniture. Stylish and compact with a contemporary raised panel front. 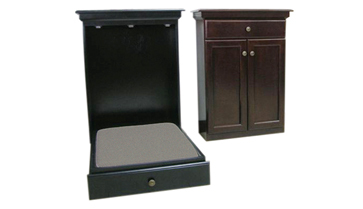 Pet Murphy Bed dimensions (closed): 24” W x 36”H x 10” D.
Mattress dimensions: 23”W x 28”L x 3” Thick. Outside of mattress is made from 350 Grams/yard fleece (gray or off white). Mattress fill is made of Polyester. While teak wood is in shorter supply and expensive, rubber wood is a perfect replacement to any solid wood for interior decor. It’s beautiful, lighter and can be easily finished, all while you are doing your part to save our forests. Excellent stability, strong and durable. Hand crafted in Thailand. Top Ten Products for the Dog that Has Everything! Featured on the April 9, 2007 "Storage Episode" of the Rachel Ray Show! SAFETY INFORMATION 1: The Pet Murphy Bed is on a Free Hinge, DO NOT DROP! Manualy guide the bed all the way down until it rests on the floor. Watch your feet. 2: Use the pre-drilled holes and supplied screws to secure the Pet Murphy Bed to the wall to prevent accidental tip-over. SHIPPING NOTICE: Due to the size of this product, expedited (air) shipping is unavailable. Please use Standard UPS Ground shipping instead. The Pet Murphy Beds are made upon order. Please call 1-877-844-4438 for purchasing information.